Teams of Rebuilding Hope volunteers assisted with cleanup in Elm City on Sept. 20 following a tornado spawned by Hurricane Florence and in Warsaw on Sept. 22 with cleanup from the hurricane. 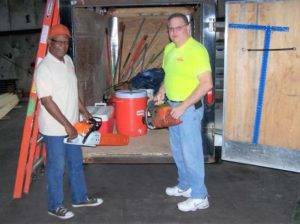 Volunteers Leo Suitte and Steve Lyles equip a trailer with chain saws, generator and other items needed to help Hurricane Florence victims. 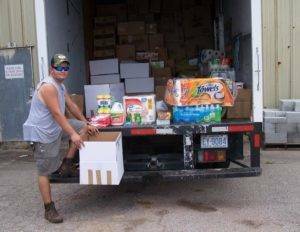 RHI volunteer Jeffrey Strickland packs supplies for victims of Hurricane Florence. In another disaster relief effort, RHI called for donations of cleaning supplies, paper products, nonperishable foods, and other essentials for hurricane victims. On Sept. 22, the supplies were delivered to the Core City FWB Church in Craven County, a collection site for Craven and Jones County victims. To further assist victims, RHI is working on plans to assist repairing homes. A partnership would be with either North Carolina Baptist Men or a local church in eastern North Carolina. RHI began preparing to offer assistance to hurricane victims as the path of the hurricane was announced. Within days, two tool trailers were outfitted with chain saws, generators, ladders, ropes and chains, safety equipment and a variety of tools. A tractor and skid steer loader were serviced and readied for use. As the path of the storm veered away from local communities, volunteers looked toward helping storm-ravaged communities in other parts of the state and waited for a call. Gearing up for this kind of mission is a first for Rebuilding Hope. “We have the equipment, and volunteers are eager to help,” RHI coordinator Randolph Wilson says. RHI’s mission is always Christ-centered. “When we serve, we want victims to know that we come in the name of and with the love of Jesus,” Randolph says.